Ahoy Mateys! Step aboard the finest sailing ship sound effects library in the land. Whether you’re working on an exciting Pirates of the Caribbean style video game or a relaxing sea-faring romance, the hours of exceptional background loops and additional cutting edge ship sounds contained within this sound pack will set your project on a course to excellence! Whether your adventure takes place in the MAIN DECK, CABIN, BELOW DECK, atop the CROWS NEST, in a MEDIEVAL PORT, or on a DISTANT SHIP in the HIGH SEAS we’ve got you covered! 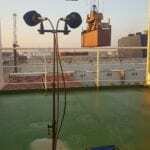 Each ambience contains MULTIPLE VARIATIONS, ALL WEATHER CONDITIONS, and MULTIPLE INTENSITIES to cover each and every part of the ship, on the rough and calm seas, this sound effects library is perfect for every situation you need. Our expert team of sound designers have meticulously crafted each ambience into CONTINUOUS, NON-REPETITIVE, DRAG AND DROP-READY LOOPS that will serve as perfect background audio for your game, film, animation, live event, or even as relaxing background audio! We have even included FULL and SIMPLIFIED MIXES, ISOLATED WEATHER, OCEAN and WOOD CRACKING versions, SHORT and LONG non-repetitive variants, and numerous other options for your convenience! With FREE UPDATES, FOREVER! and FREE BONUS AMBIENCES: MEDIEVAL PORT and isolated, SEA, SAILS and FLAG FLAPPING, Ship’s BELL RINGING, WEATHER and WOOD CRACKING SOUNDS, all supplied in industry standard Hi-Rez WAV and Hi-Quality MP3 formats, there’s no better time to set sail on the high seas with this ONE OF A KIND sound pack! So what are you waiting for? Take command of this UNIQUE library and begin your journey on the high seas today! 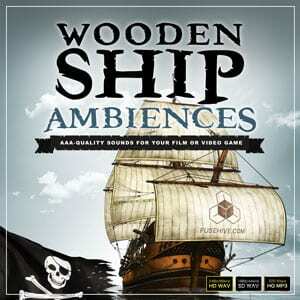 • Huge variety of Old Wooden Ship Interior and Exterior Ambiences, All Weather Conditions and Additional Useful BONUS Sound Effects for every scene or situation. • Multiple variants and intensities for your convenience and additional edit options (lengths, looping versions, stingers, etc. ).